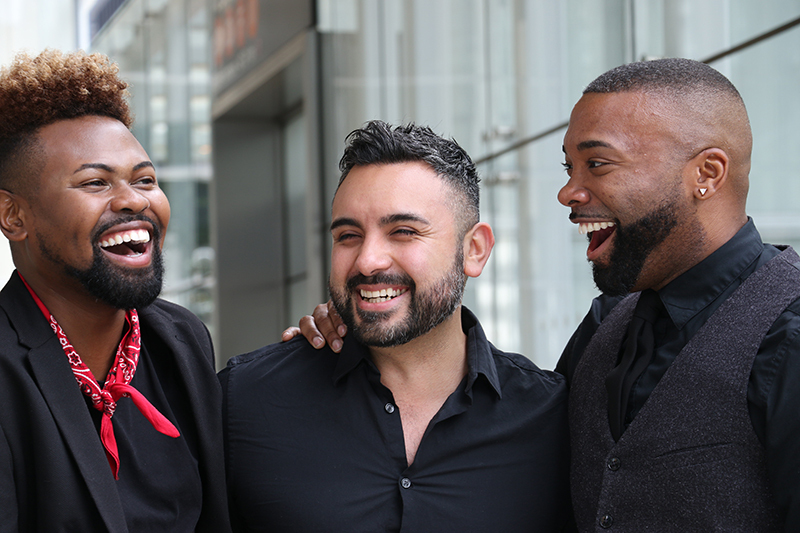 Novo Novus Productions is an award winning multimedia production focused on producing film, web, and theatre content that highlights the LGBTQ community of color. Recent work includes three seasons of the pioneering hit comedy web series DRAMA QUEENZ (YouTube & OutTV), the acclaimed features BWOY (starring Star Trek: Discovery's Anthony Rapp), WHAT IT WAS (Frameline, OutFest, HBO Urbanworld film festivals), THE BREEDING (winner, Best Feature, 2018 Harlem Int'l Film Festival, released by Breaking Glass Pictures), DADDY'S BOY (Cinequest & New Orleans Int'l Film Festivals), SUBWAYS (winner, Best Feature, 2015 Harlem Int'l Film Festival), and the award-winning BOYS LIKE YOU (Best Short, North Carolina LGBTQ Film Festival, currently distributed through Guest House Films). Other notable work includes the critically acclaimed docu web series FADE IN (about homeless LGBTQ youth in New York City), and the award-winning play REFLECTIONS IN A DITCH. Founded in 2008, Novo Novus Productions is committed to defying the traditional hindrances that restrain creativity; thinking outside the box in order to fully realize quality. By creating dynamic works through various mediums and re-envisioning classic ones, Novo Novus hopes to inflict a positive change in society, becoming a catalyst for new thought in a world ripe with endless possibilities. Dane Harrington Joseph (Founder & Executive Producer) is a writer & producer out of Harlem by way of Detroit. He is the creator of DRAMA QUEENZ, a hit web series that ran for three seasons and featured in numerous publications & “best of” lists (www.dramaqueenztheseries.com). Most recently, he wrote & produced the indie feature-length thriller, THE BREEDING, which won Best Feature at the 2018 Harlem Int’l Film Festival, as well as an official selection to the Capital City Black Film Festival and the HBO NYC Latino Film Festival. He created the Bravo series YOUR HUSBAND IS CHEATING ON US, starring R&B superstar Ginuwine. He also wrote & directed the award-winning film SUBWAYS (Winner, Best Feature, Harlem Int’l Film Festival), and served as executive producer on the film BWOY (2016 Chicago Reeling Film Festival Centerpiece Selection), which was directed by Sundance & Tribeca alum John G. Young & starred Anthony Rapp (A Beautiful Mind, Rent, Star Trek: Discovery). He earned a masters from Columbia University, a bachelor’s from Seton Hall University, and graduated from the prestigious Interlochen Arts Academy. Proud member of Writers Guild of America-East. Daniel Armando (Executive Producer) is an award-winning filmmaker and producer raised in California now residing in New York City. He has produced five micro-budget indie films, including DADDY’S BOY (Official Selection Cinequest Film Festival), WHAT IT WAS (Official Selection HBO Urbanworld, Outfest, NewFest, and Frameline film festivals), THE BREEDING (Winner, Best Feature, Harlem Int’l Film Festival), and BWOY (starring RENT & STAR TREK: DISCOVERY’S Anthony Rapp). His first project, the short BOYS LIKE YOU, won him “Best Short” at the 2011 North Carolina Gay & Lesbian Film Festival. He was also the co-Executive Producer of the award-winning stageplay REFLECTIONS IN A DITCH (winner, Best Play, New York Theatre Festival). He is graduate of the American Musical & Dramatic Academy and as a performer starred in the international tour of FAME: THE MUSICAL. Dwight Allen O'Neal (Executive Producer) is a New York-based producer and TV personality who continues to rise in the entertainment industry through the launching of fresh multimedia projects; full of unique content with relevant messages. Dwight Allen O'Neal has always been a class act with qualities that tagged him as Little Rock, Arkansas' very own local celebrity, having eminence that allowed him to stand out from the norm tagged him with the phrase O'Neal Appeal. When leaving the South in pursuit of his Hollywood dream, Dwight decided to buff his talents to perfection at the American Musical and Dramatic Academy. Working as a professional entertainer under the name Allen O'Neal, he’s been seen on the big screen in Hitch, as well as on Comedy Central, MTV, in Rolling Stone, and in several commercials, modeling campaigns, and much more.When the opportunity arrived for O'Neal to write an advice column in Teen People magazine, it opened his eyes to his ability to assist teenagers with the many issues they may face. He was thus inspired to mentor LGBTQ youth through the arts by writing, creating, and producing Christopher Street, a hit series now available on DVD and On Demand through TLA Releasing. In addition to his artistic endeavors, O'Neal has recently become a celebrity make-up artist, counting Gossip Girl's Leighton Meester as one of his favorite clients. Dwight was also named one of the hottest rising “out celebrities of color” by Instinct Magazine, and has developed an interviewing dating show titled Dating Dwight. He also works as a media correspondent for TheFutureForward.net with his very own column “Dishin' It With Dwight,” where you can expect for O'Neal to talk to viewers/readers about dating, fashion, beauty, exclusive interviews with celebrities, and hearing this GAYLEBRITY rant as he continues down his journey of staying forever young, looking fabulous, and making his way towards greatness.